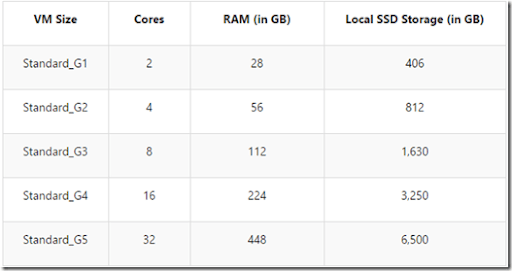 A while ago I wrote about how Azure was offering high performance ‘D’ machines, now comes news of even better ‘G’ machines. As you can see from above table, it is no wonder they have been dubbed ‘Godzilla’ machines. 32 cores, 448 GB of RAM and 6,500GB of SSD storage! Staggering. 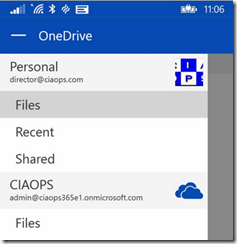 Microsoft has updated the OneDrive app for Windows Phone now to include the ability to access both OneDrive and OneDrive for Business in a single place like they recently did with other platforms. To configure this, firstly ensure you have the latest version of the OneDrive app from the Windows Store on your device. Then go to the list of apps and select OneDrive. 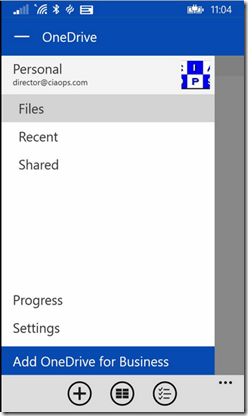 If the app has been updated you should see Add OneDrive for Business as an option at the bottom as shown above. Select this. 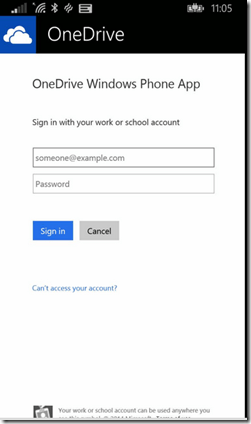 You’ll now be prompted to enter your Office 365 credentials and Sign in. You should see the account being added to your OneDrive app. 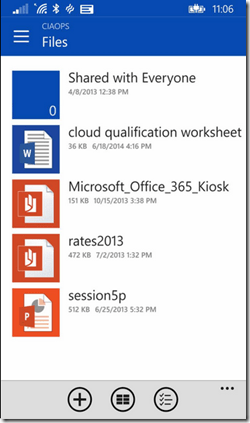 When complete your OneDrive should appear in the list as shown above. 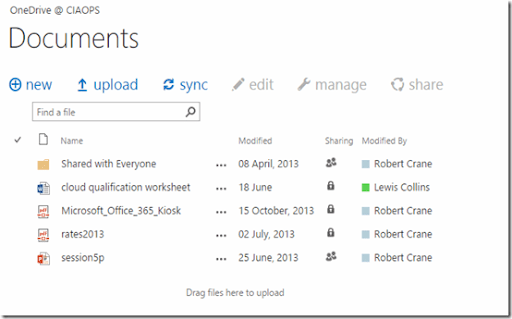 Select Files (under this new item) to view your OneDrive for Business content. just as you would see them in a browser. 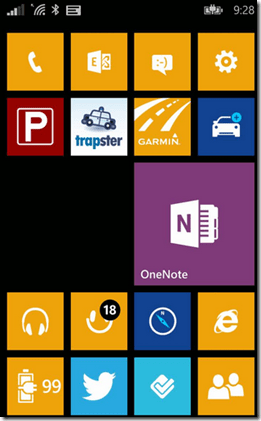 Nice improvement that brings the Windows Phone app to par with apps on other platforms. If you do a lot of Office 365 demos like I do, it makes sense to build a clean virtual workstation in a datacenter that is near the Office 365 datacenters. For me that is in Singapore which equates to Southeast Asia when running up an Azure virtual machine. 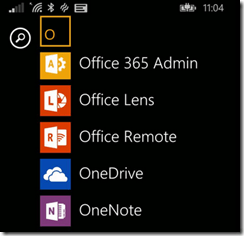 That way you get the best experience possible between Office 365 and workstation, which is why this configuration is great for demos (apart from the fact that you can run them anywhere and on any machine that has Internet connectivity). I’m sure there’ll be more regions soon, so stay tuned to those pages for all the details. I am however happy to announce that as an added bonus for attendees of this workshop VMVault will be taking us through their NextDC B1 Datacentre. The tour lasts about an hour and you’ll get to see all the facilities of a modern data centre with expert tour guides on hand to answer all your questions. This is a fantastic opportunity not to be missed and I thank Radek from VMVault for making this available to attendees. Here’s something a bit different from Microsoft, a screen lock for Android phones. Who’d though eh? An indication of the fact that Microsoft is becoming more platform agnostic, which of course displeases pure Windows people (you can never please everyone right?). But hey, more software the better right? 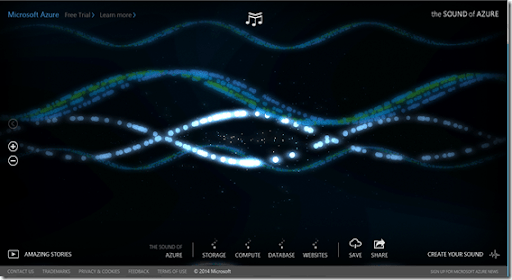 Certainly for Microsoft! Problem is that I can’t get in here in Australia on my device. Hopefully down the track when they make it available outside the US where I believe it is limited to currently. In my experience the best nav app is Here from Nokia (yup, even better than Google Maps in my books). 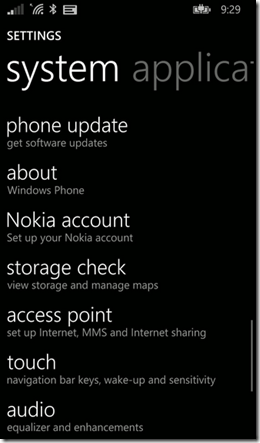 Going forward HERE isn’t part of the Nokia Microsoft bought, it is remaining a separate entity. So, if you are like me and you love all the HERE stuff then take a moment to ensure you have them all on your devices and sign up for a free HERE account to link them all together. 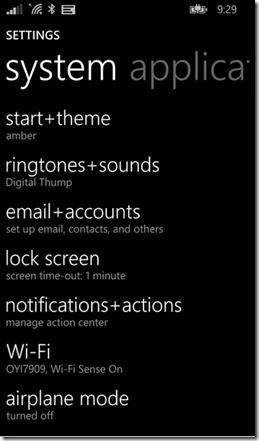 One of things that I found enabled when I updated my Windows Phone to 8.1 was the screen ‘wake up’ feature. Basically, this allows you to double tap the screen and it will come to life. Great idea, but for me it seemed that I was always turning the phone on accidentally. That is no good for optimising the power usage of the device, so after persevering with it for a while I decided that I would prefer to have it off and save the power. If I need the phone, it is easy enough to turn on with my ham-fists. So here’s how to disable the ‘Wake up’ screen feature as it is buried a few layers down. 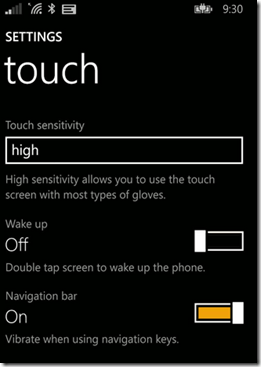 From the initial screen navigate to Settings. In my case I have pinned that to the top right of my phone start screen. Scroll down the option Settings. Towards the bottom you will find Touch. Select this. Then set the Wake Up option at the top to Off. With this set my phone is back to having me turn it on to use which is what I want because I want to maximise the power available to my phone throughout the day.